Affiknitty -: This FO was a labor of love . . . This FO was a labor of love . . .
. . . and truly a team knitting project! Every once in awhile, a knitting project comes along that gives you a chance to show someone just how much you care. My dear friend Angie, who first got our knitting group going, was diagnosed with breast cancer a few months ago. She has a good prognosis, a positive attitude, and a stellar support team. But all of that can't change the fact that the situation is lousy. As the news spread, of course everyone wanted to help in whatever way they could. One friend, acting as her awesome "techno-secretary", helped her start her own blog to keep friends and family informed. There have been meals planned, distraction provided by playing Words With Friends (what sacrifices we make! ), and hopefully, emotional support provided. But leave it to our friend Betsy to come up with the wonderful idea of a group knitting project, and thus the blanket of love was created. Photo by Amber Galusha of the Nature-Drunk Blog. Source: Published in the Mason-Dixon Knitting Blog, PDF purchase available on Ravelry. Materials: Noro Silk Garden in various colors, Brown Sheep Lamb's Pride Worsted in "Creme", and US 6 needles. Betsy happens to be a great instigator of marathon knitting projects! In addition to being the key motivator on the blanket, she also acted as the "hostess with the mostest" last year when she invited our knitting group to stay at her family's coastal getaway for a weekend Fair Isle knitting class. We didn't find out until after arriving that we would be knitting our entire Fair Isle Tote in 3 days, even though the weekend class was normally taught over the course of a few weeks. Just as we relished knitting together then, we poured our group energy into finishing the blanket before Angie's first surgery. Each member of the knitting group (excepting the giftee, of course): Betsy, Karen, Lisa, Amber, and I, plus Marilyn, who taught us how to knit, chose a different skein of Noro Silk Garden. 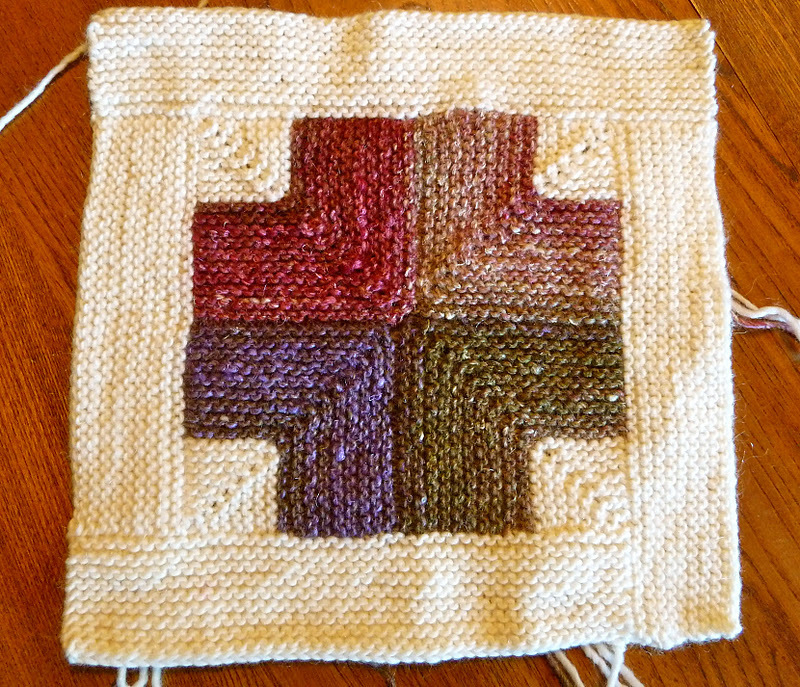 Then we all proceeded to knit a square or two. We met for extra knitting nights and had secret lunch knitting meetings. We sent out group emails with care, double-checking that we left Angie off the mailing list. Finishing work continued as a collaborative effort as tasks of weaving in ends, seaming squares together, knitting the I-cord edging, and washing and blocking the blanket were carried out by various members of the knitting group. 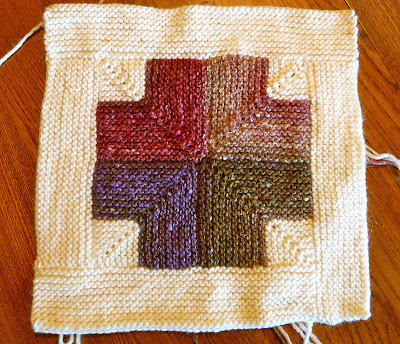 corners flow naturally from just one skein of Silk Garden yarn. Of course there were many yarn ends to weave in on the back of the blanket! In the end when Angie wrote a blog post (where you can see her new puppy Thor cuddling on the blanket) about the support she had received, my favorite response in the comments section was from Betsy, who said: "Glad Thor approves of the blanket; It is full of love. And if you ever doubt our friendship, just look at the back!" I hope the blanket is keeping Angie warm right now, and I wonder what marathon knitting project Betsy will come up with next! As always, you can read about other knitters showing their love with knitted FOs at Tami's! 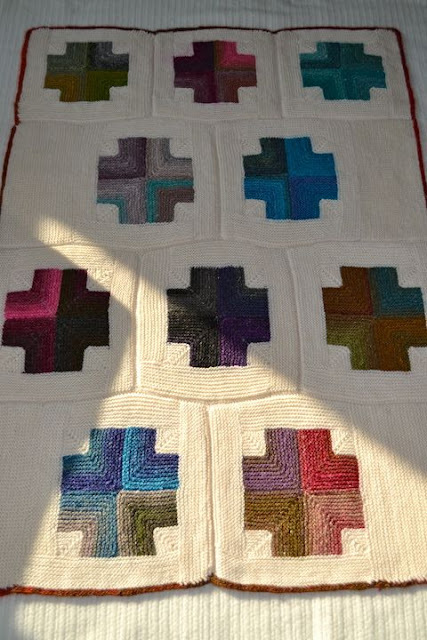 Beautiful friends, beautiful blanket, beautiful blog post. Thanks for telling the story of our love blanket, Shannon. It really is lovely, isn't it? Absolutely lovely! Reminds me of the Yarn Harlot's post yesterday about knitted gifts being a way "to make the love that they feel in their hearts tangible, visible and warm." what a beautiful gift of love. Gorgeous and an amazing, touching gift. I'm sure she LOVES it and will love it for many years to come. This brought tears to my eyes, it is so very lovely. It warms my heart to know there is so much love in the world. I can't express the gratitude I feel each time I see my beautiful blanket and feel its warmth. The love and care each of you took in its making truly penetrates my body each time I lay it over me. I will treasure it forever, along with our invaluable friendships we've woven together. Knitters are the kindest people. Thanks for healing me! What a lovely gift. Good to hear your friend's prognosis is good. I have a friend who just finished her final treatment (blogged here - http://pinchypants.wordpress.com/) and my MIL has also just finished radiotherapy. I think that support and love goes such a long way - your friend is very lucky to have you all - sending lots of healing vibes her way. It is a beautiful blanket in so many ways...a wonderfully comforting gift of love for a friend in need. The colors are gorgeous. I love this idea. I made a comfort blanket out of the scraps from all the garments I had made the various members of our family. So each time he needs it when going through his chemo he has a little bit of each of us to wrap around him. what a beautiful labour of love! Loved reading this wonderful post.